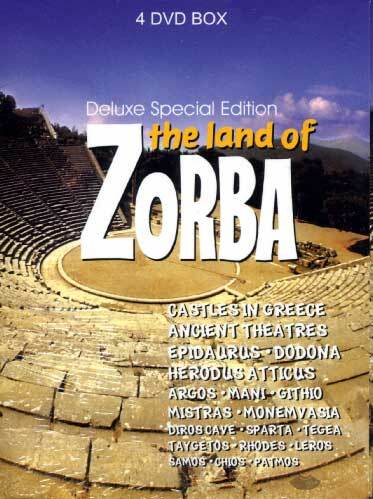 The unspeakable beauty of Greece in a 4 DVD box. 300 minutes of traveling around temples, theatres, statues and citadels reveal that Greece loved life, sunlight and clear blue sky. The target of this series is to help the viewer discover the beauties of Greece, the myths, the reality, the villages, the infinite blue, the monasteries and the castles, the picturesque alleys and of course the beaches. Greece, the land of Zorbas, represents the ideal place for holidays and rest, combining natural beauty with the warmth of the inhabitants and the Greek hospitality. Castles in Greece, Ancient Theatres, Epidaurus, Dodona, Herodus Atticus, Argos, Mani, Githio, Mistras, Monemvasia, Diros cave, Sparta, Tegea, Taygetos, Rhodes, Leros, Samos, Chios, Patmos.